I don’t get caught up in the annual Super Bowl hype. Well. Maybe I had a peek or two at the half-time show…and felt a smidge of excitement over the news that Canadian television will air the much-touted American SB commercials next year. Alas, I confess: I didn’t even know which teams were vying for the coveted winning title. But, I did conjure up a super bowl of my own this past Sunday. And it was divine! 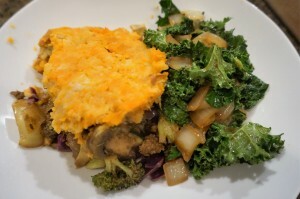 This is my off-the-cuff, what-have-I-got-going-in-my vegetable-crisper riff on traditional shepherd’s pie. 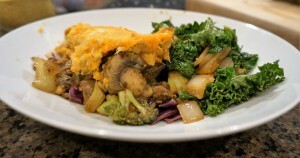 Delicious, comforting, filling, and of course, healthy as all get-out! Melt coconut oil in large skillet (1-2 tbsp.) over medium heat, and saute onions for 15-20 minutes. Add ground bison (enough for 3-4 servings), breaking into smaller pieces as it cooks. Add all vegetables and spices and continue to saute vegetables until soft. 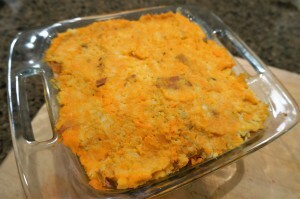 Remove from heat and pour into small casserole dish. Meanwhile, add chopped cauliflower and sweet potatoes (for topping) to steamer; steam until soft, about 25 minutes. Transfer to bowl and mash with sea salt until well mixed. Spread mixture over top of veggies in casserole dish. At this point, feel free to pour a little extra virgin olive oil, or nutritional yeast (or parmesan for dairy-lovers) over top. Place in oven for about 15 minutes, until flavours meld. Remove from oven and let sit for about 10 minutes before serving. 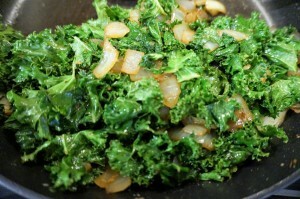 While the casserole is in the oven, I decided to do a little number with my beautiful bundle of kale. So, I returned the big skillet to the stove top, melted more coconut oil and repeated the onion saute, as above. Plenty of garlic and ginger joined the pan. When the onions were soft and translucent, I added pieces of torn kale (sans stems), some good sprinkles of tamari sauce, and sea salt to taste (don’t overdo the salt as tamari is quite salty). I stirred the kale until slightly wilted, about 5 minutes.